It’s an air filter. Over 30 years of allergies, and two continents, no allergy doctor ever mentioned air filters to me, but it makes all the difference in the world. And has no side effects, other than a little bit of noise and a little bit of electricity consumption. Here is the proof: today, I’m working out of my home office, and it is the first day I suffer from airborne pollen this season. I guess you know the feeling if you read this. 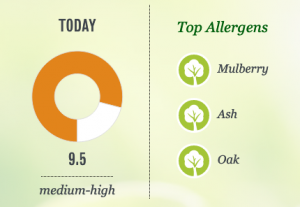 See the picture on the right for today’s allergy report from Pollen.com — not that they need to tell me that. I’ve had an air filter for this office for a while, but this year, I also have an indoor air quality sensor from Purple Air that knows how to count particles in the air. So we can turn anecdotal evidence into hard evidence. And here it is. My nose, eyes, throat, skin and assorted other parts of my biology — much more sensitive sensors than anything even from Purple Air, I beg your pardon — agree. My nose is open now. No extra pills required. No tiredness etc.